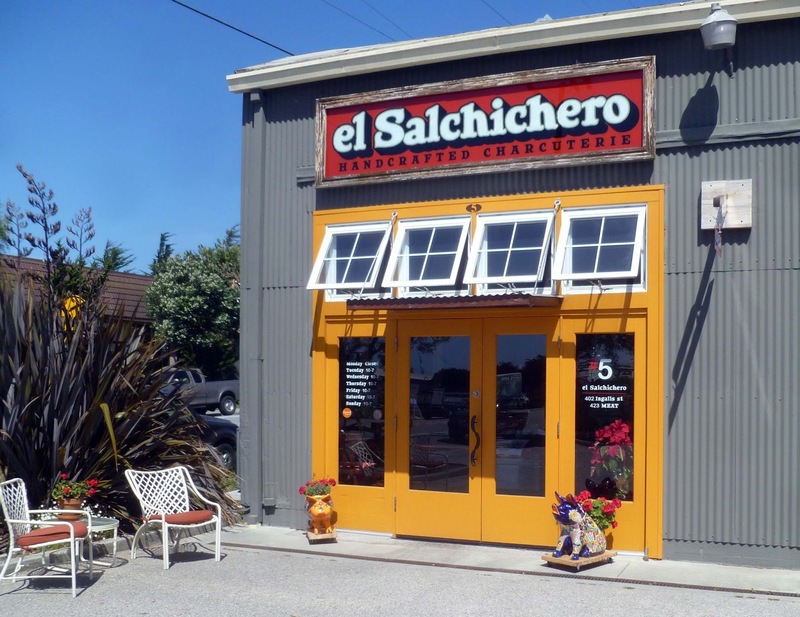 El Salchichero is located in a small courtyard off the main streets. The outside is colorful and inviting. A dog watering station and hitching post is set up for your canine companions. 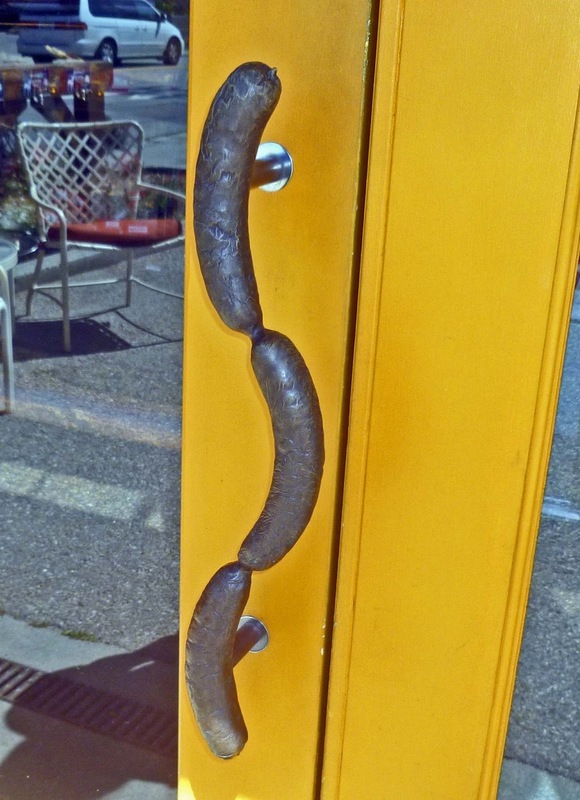 The door handle is a cast in the shape of some link sausages. We are excited before we even have stepped through the doors. 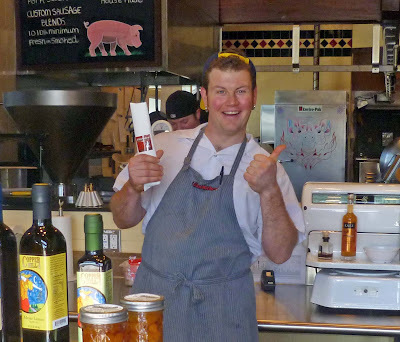 Once inside, we are greeted by charismatic Chris LaVeque owner and head charcuterie maker. 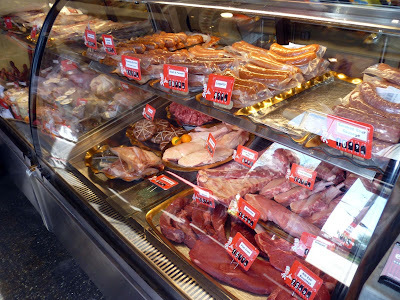 The place is small with one refrigerator case displaying various meat products. Despite the small space the store is stocked in local products such as pickles, olive oils, vinegars, pasta and so much more all from local venders and farms. We are a little overwhelmed with the selections and go straight to the bacon. There are several selections of bacon to choose from. Chris explains that all his bellies are sourced from local farms. Hickory wood is the smoke of choice. The bacon is dry rubbed, cured and cold smoked. Different herbs and flavorings are used in different batches. 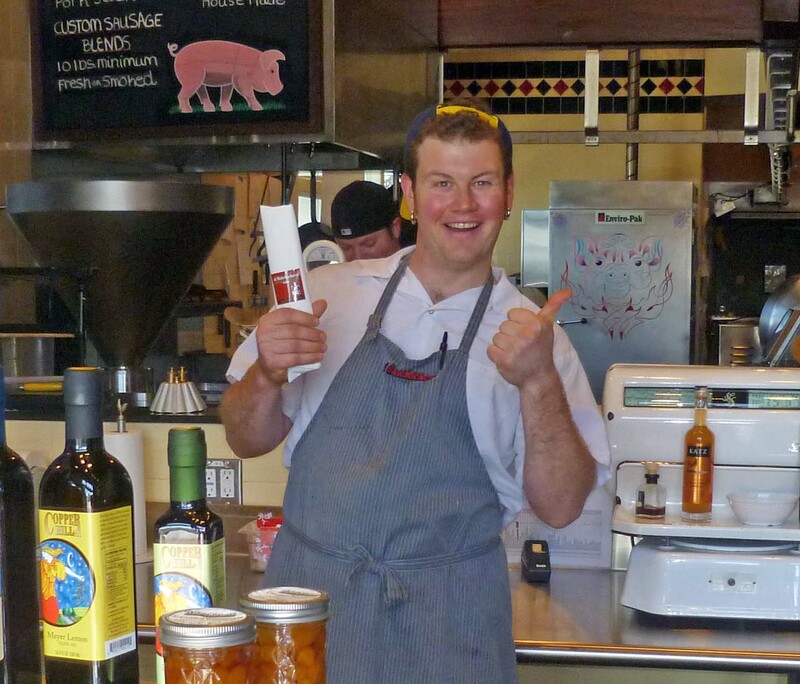 Chris proudly tells us the ingredients in his offerings and offers this information again on the packaging label. We make several selections of bacon and sausage. We return home in anticipation of bacon delight. ‘Saffron Bacon’ would be on our plate tonight. This bacon was cured with ranpor lime, sea salt, honey, celery baste. evaporated cane juice, celery powder, saffron and spice. These are some unique ingredients for bacon. They are meaty and have a slight lime fragrance. 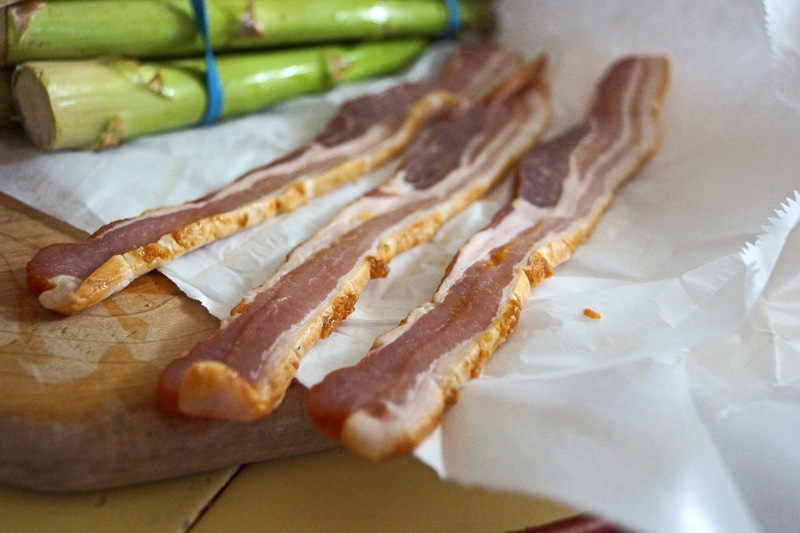 These meaty rashers will be wrapped around some fresh asparagus sourced from the ‘Richmond Farmers Market’. These wrapped bundles of joy will be sprinkled with some Meyer lemon juice, olive oil, parmesan cheese and sea salt. 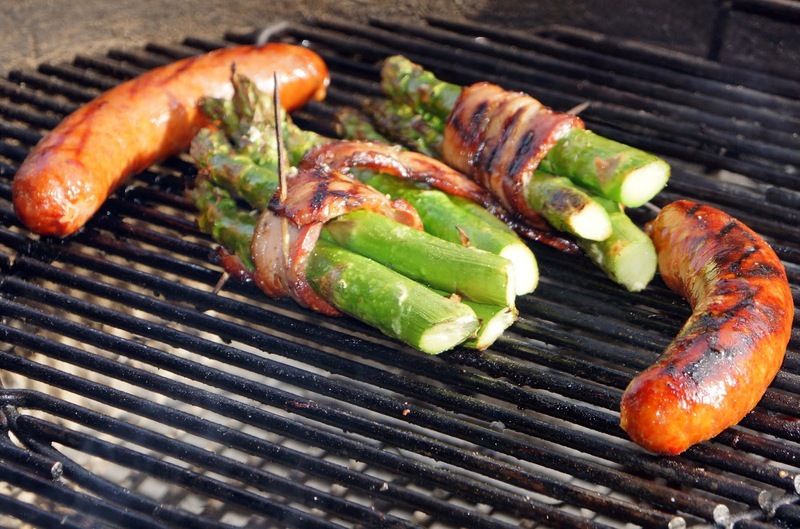 They will be grilled over a hot mesquite fire. 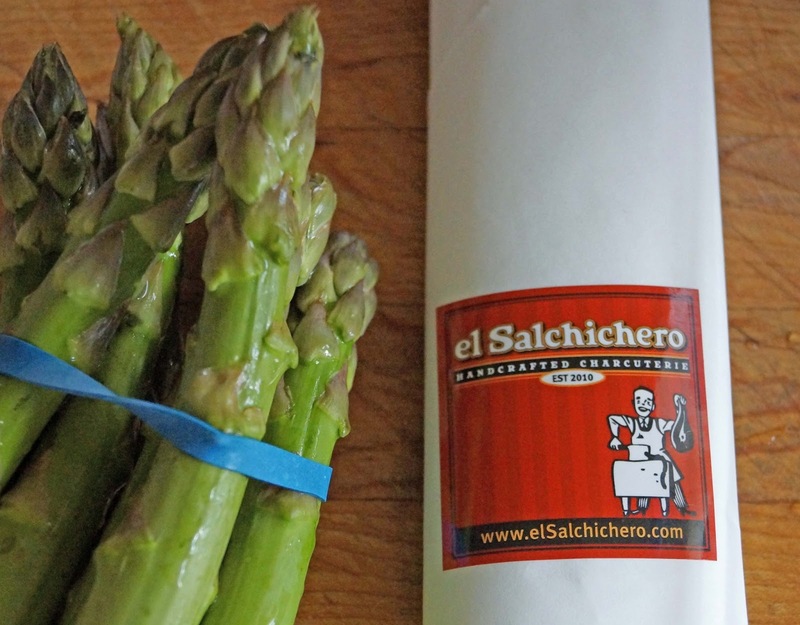 Accompanying the asparagus will be some “Gyeong-Go Bul” a hot Korean style sausage also purchased from El Sachichero. This bacon was spectacular. It was meaty and had a slight beef like flavor. There was a lime flavor accented by the lemon juice. I am not sure if I actually tasted a saffron flavor but even so it was fabulous. This was the perfect asparagus meat wrapper. The sausage was spicy and yummy. El Salchichero was a great ‘Meat Adventure”. We have another bacon flavor for a ‘Bacon Revue” to follow shortly. 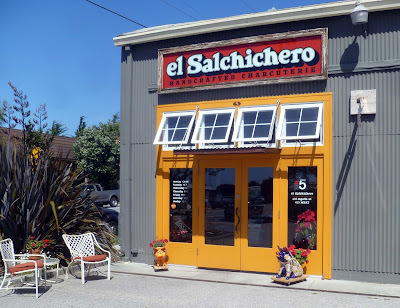 I am already planning a return trip to El Salchichero. 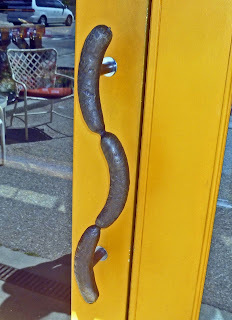 Is that a sausage as your door handle or you just glad to Meat us! What a find! Now I want to go! Saffron bacon? That's a new one to me but it sounds good. Nice and thick at least. Cute exterior too, great shop. What a great-looking place!! Totally a destination. That celery stuff in the ingredients has the effect of pink salt. Celery is loaded with nitrates. Between this and Freedom Meat Locker, I think I have critical mass providing an excuse to visit Sante Adairius Rustic Ales in Capitola- thanks. Bacon and sausage too! That meat counter is spectacular. Zoomie, You could bring Cora and hitch her to the doggie post out front. Chris, Great bacon. Saffron sure grabs your attention. cookiecrumb, I know that you know bacon. I tried some of your bacon and it was fantastic. Aaron, Freedom was our first stop. 80-101-152-1 scenic route to Freedom. Great produce stand at the bottom of the hill of 152.Are you judging this Sunday? Greg,I need to bring two ice chests next time. No, can't make Smoke on the Mountain, alas. Sundays are tough for us and we just got away with one in Woodland.